Management plans for the East Mountain Open Space Areas including Juan Tomas, Tres Pistolas, Gutierrez Canyon and San Antonito were developed through a cooperative planning process between the City of Albuquerque, Bernalillo County and the United States Forest Service under the guidance of the National Park Service, Rivers and Trails Program. This is a public participatory process that includes East Mountain residents and Open Space users. This 40-acre facility is located 9.5 miles south of I-40 on NM Highway 337. Take exit 175 on I-40 and head south until you see the signs for the facility. Nestled in an area populated by ponderosa, piñón, juniper, scrub oak and yucca, Carolino Canyon proves to be an ideal location for gatherings of all kinds. The facility can accommodate up to 250 people and consists of two large picnic shelters with electrical outlets. There are numerous small picnic areas, tetherball units, horseshoe pits, volleyball facilities, charcoal grills and a fire pit. The facility also has a paved hiking trail that is wheelchair accessible. The Juan Tomas Open Space is named for the nearby village of Juan Tomas that was settled around 1860. This land became part of the Open Space system in 1983 and was part of the Elena Gallegos exchange lands from the USFS. At elevations ranging from 7,300 feet to 7,760 feet, this 1,290-acre area is characterized by gently rolling pinon-juniper forests, with scattered stands of ponderosa pine trees, scrub oak thickets and several open meadows. Mule deer and wild turkeys frequent this site and an occasional elk has been reported. 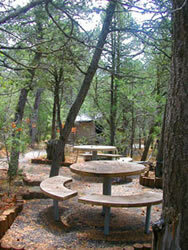 There are no developed facilities at the Juan Tomas Open Space, although there is an extensive network of informal trails, many of which provide access to the adjacent USFS Oak Flat Picnic Area and beyond. The Ponderosa Trail is the main trail running diagonally across this property and is popular with horseback riders. From Interstate 40. get off at the Tijeras exit on to Highway 337 (old south 14), go south approximately 9.1 miles, make a left on to Oak Flat Road, go east for about 2.2 miles, there will be an Open Space gate with regulation sign on the north side of the road. Parking is alongside Oak Flat Road. The 105-acre property is under joint management between the City of Albuquerque and Bernalillo County. Named for a spring located within the Sandia Mountain Wilderness Area. Elevations range from 6,140' to 6,400' of pinon-juniper grasslands with several steep-sided arroyos used by a variety of wildlife including deer, coyotes, bears and mountain lions. 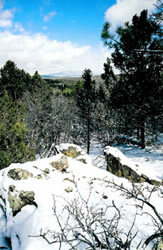 This site offers access to the Sandia Mountain Wilderness Area via the Three Gun Spring Trail and the Hawk Watch Trail. The Gun Spring Trail connects with the Embudo Trail and the Sandia Foothills Open Space. There are no additional facilities at the site. Access to this property is through a residential neighborhood. Please respect out neighbors. Take I-40 to the Carnuel exit, get on the frontage road (Old Route 66), head east to the Monticello Subdivision, there will be a small brown and white Forest Service sign for Three Gun Spring, make a right, go about 2 miles, make a left, take the second right and this will end at the trailhead. The trailhead is actually on Forest Service land. The 300-acre Gutierrez Canyon property was purchased by the City of Albuquerque in 1963, making it one of the first pieces of land the City set aside for the preservation of nature. In 2008, the City purchased a 420-acre property contiguous to Gutierrez Canyon now know as the "John A. Milne Open Space.” This addition creates a total of 720 acres of protected Major Public Open Space stretching from Highway 14, east to Gutierrez Canyon Road. Elevations here range from 6,100' to 7,600'. Steep-sided, rocky canyons containing usually dry stream beds characterize this property. Pinon-juniper forests dominate this site, but there are also scenic stands of ponderosa pine. Deer, bears and mountain lions are frequent visitors to this area. Visitors can enjoy spectacular views of the East Mountains from various vantage points in the John A. Milne Open Space. A formal parking area off of N.M. Highway 14 is available near the Cedar Crest Post Office. The parking area includes space for horse trailers. While a series of informal trails exists on the property available for hiking, horseback riding and mountain biking, the Open Space Division is currently working to formalize a sustainable trail system. Many of the existing informal trails lead to private property. Please respect all private property. 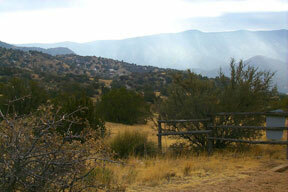 Access to the John A. Milne Open Space is off of N.M. 14, south of the Cedar Crest post office. Access and parking to Gutierrez Canyon are through a residential neighborhood. Please respect our neighbors. Call the Open Space Division for directions. The 168-acre property was purchased by the City of Albuquerque in 1968 and is one of the earliest pieces of property to be set aside by the City for the enjoyment of the nature. There are no facilities located at this property. There is a network of unofficial trails, some of which lead onto private property. There is also a private in-holding surrounded by the Open Space. Please respect private property. Access and parking are through a residential neighborhood. Please respect our neighbors. Call the Open Space Division for directions.